From a fat-free FIDDLER to a singing bus… here’s New York’s Spring 2004 musical season in a nutshell. FIDDLER ON THE ROOF. Hard to imagine the ‘60’s blockbuster and theatre-party staple as a source of controversy, but here it is. David Leveaux’s production is elegantly Chekhovian; moreover, the director and a few cast members are British… which to some also reads Goyish. Is this indeed the Jew-less FIDDLER, a concept so anti-semitic Mel Gibson could have come up with it? Not really. The revival is short on schmaltz, but that’s not quite the same thing. Leveaux’s lantern-lit stage pictures are beautiful, rooted in a modern European aesthetic that whisks away some cobwebs. (Note that even Leveaux isn’t willing to jettison the legendary Jerome Robbins choreography, which is recreated in all its finger-snapping, arm-waving glory.) He also keeps the pace fast and the textures light… and here’s where the problems begin. The ensemble – from a Fyedka who looks like Jon Bon Jovi to a too-young Yente – is competent but generic. Only Robert Cariani, a creepily twitching Motel (you might think “Bates Motel”), is actually bad, but only Randy Graff, a touching Golde, is memorable. And what of Tevye, the show’s heart and soul? Alfred Molina is a fine actor, but merely life-size when we want something grander. It’s a performance that’s short on shtick (welcome) but also on emotional weight (disappointing), and ultimately he doesn’t add up to The Big Zero. Perhaps there’s something to be said for Tradition after all. Minskoff Theatre, 800-755-4000. Open run. WICKED. It’s easy to see where the (multiple) millions were spent on this WIZARD OF OZ permutation, which happily for its producers is the season’s biggest musical hit. 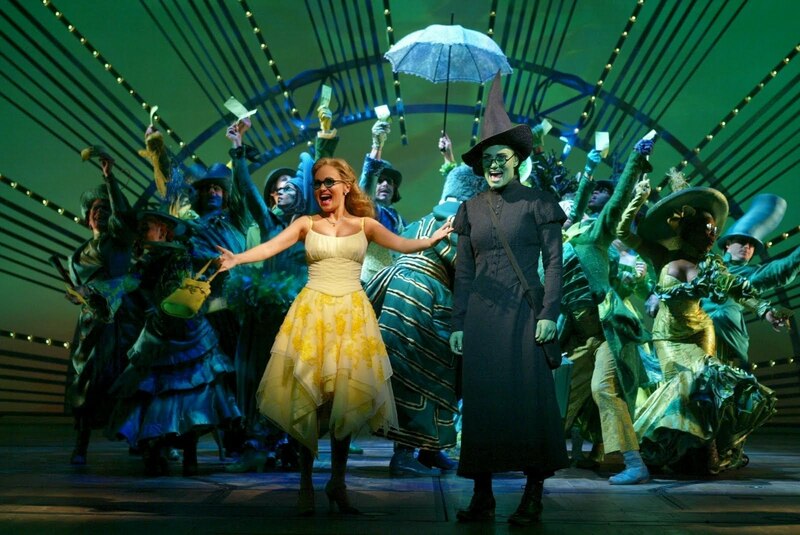 WICKED is undeniably enjoyable, but critically speaking it’s a mixed bag. Kristin Chenoweth (Glinda) and Idina Menzel (Witch of the West) offer powerhouse performances (though Menzel’s singing style – start soft, end loud – grows wearying), but the script offers few opportunities for character development. There’s so much busy stage action that the story seems mere background information. Even the scenic effects are uneven: the flying monkeys are grand, but some beloved OZ icons – the twister, the flying witch, and especially the famous melt-down – fall flat. Gershwin Theatre, 800-755-4000. Open run. WONDERFUL TOWN. Leonard Bernstein’s 1953 musical about two Ohio-bred sisters carving out a life in Greenwich Village retains every ounce of its freshness, and the magnificent music – heard here, thank heaven, with its full orchestra! – makes every current Broadway score sound puny. Director Kathleen Marshall’s staging captivates with its energy, charm and period style, and among the ace cast Donna Murphy stands out, giving lessons in a kind of star power one might have thought a forgotten art. Along with AVENUE Q, WONDERFUL TOWN is – so far – my Pick of the Season. Al Hirschfeld Theatre, 800-545-2559. Open run. JOHNNY GUITAR. If musicals are the favorite gay theatrical form, this must be a double-scoop: JOHNNY, a self-styled country rock show, is based on the camp/cult classic Joan Crawford film Western. Sounds intriguing… especially with the delightful Ann Crumb leading the cast. Century Center, 800-432-7250. Open run. CAROLINE, OR CHANGE. I saw this in its debut run at the Public Theater, and thought the show confounding. At the core of the pedigreed piece (Tony Kushner wrote the libretto, Jeanine Tesori the score) is a fragile, Capote-esque tale of an affluent White Jewish boy growing up in Louisiana, and his uneasy but rewarding relationship with Caroline, the family’s tough-as-nails Black maid. On this level, all is well: Kushner’s book touches the heart, and Tesori’s score is often enchanting. But when Kushner reaches, rather pompously, for the kind of thematic grandeur of ANGELS IN AMERICA (the Kennedy assassination is theme here)… or worse, when he goes for whimsy (one of the characters is, I kid you not, a singing bus) the journey gets rocky. As Caroline, Tonya Pinkins is absolutely superb. Eugene O’Neill Theatre, 212-239-6200. Previews begin April 12th. ASSASSINS. Sondheim’s deeply-factionalizing musical (viewers love it or hate it: there’s little middle ground) finally makes it to Broadway, nearly fifteen years after its first production. ASSASSINS, a vaudeville entertainment about those who killed or attempted to kill America’s Presidents, seems to have the uncanny knack of surfacing at politically inflammatory times; obviously, this is no exception. The show needs a sure directorial touch and an excellent ensemble, and the Roundabout production – helmed by Joe Mantello, and featuring Michael Cerveris, Neil Patrick Harris and Denis O’Hare – would seem to have those bases covered. Expect the Sondheim faithful to be in full attendance… so book early. Studio 54, 212- 719-1300. Now in previews. FINIAN’S RAINBOW. Probably the most famous musical that few people have seen, so the Irish Rep does us two favors: providing a chance to see the tuneful (“Old Devil Moon,” “How Are Things in Glocca Morra”) 1940s political parable about (yes) a leprechaun; and casting it from strength (Malcolm Gets and Melissa Errico are the leads). Irish Repertory Company, 122 West 22nd Street, 212-727-2737. Previews begin April 6th, performances through May 30.